How is that highlighting done? 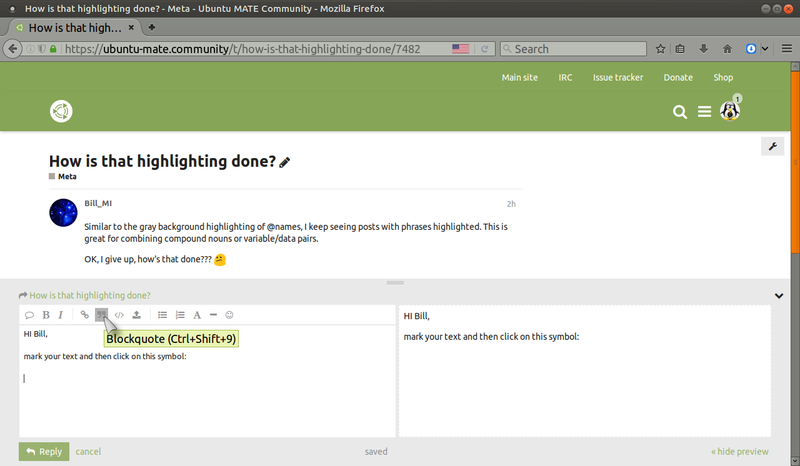 Similar to the gray background highlighting of @names, I keep seeing posts with phrases highlighted. This is great for combining compound nouns or variable/data pairs. OK, I give up, how’s that done??? Hi @wolfman Maybe my preview is screwed up because if I try to highlight > this text it doesn’t show correctly. Just sticks a greater-than in front. edit: yeah, tried to highlight “this text” in first sentence using blockquote - didn’t work. ` this is highlighted if I finish it with another backtick. Hehe… I think that does it! I tried single and double quotes but not backtick/accent. Thanks!!! OK, extended information is called for and this post is partly to confirm all my findings. Basically, a pair of backticks, <code></code> and </> Preformatted text. ALL DO THE SAME THING! Yes, the backtick works fine as done here to demonstrate. So does <code>THIS</code> which I put between backticks so the "code"s display in the post. That’s an important point. I find I cannot reverse that order to display backticks and the attempt puts the post minimized! But there’s even more. It turns out @wolfman was only one menu symbol off the answer, too. I thought the </> function called “Preformatted text” formatted code lines. Then I discover it forces backticks around selected text!!! So there’s another way to accomplish the same thing! Last, I looked up “backtick” and Wikipedia actually redirects instantly to Grave accent. I knew it was some kind of accent but not sure of details. Obviously, backtick is in heavy usage. I thought you just wanted a block quote, so yes as @marfig pointed out, use the other symbol but basically they are the same thing!. Want more types of highlighting? One more… if you like to be sophisticated.